The page title should be shorter than 580 pixels. It is currently 936 pixels long. description HomeCompany - Möblierte Wohnungen und Apartments mieten und vermieten - Agentur für Wohnen auf Zeit. 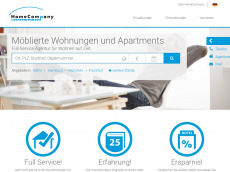 Test up to 1.000 webpages of homecompany.de with our free plan! This page contains 1239 words. That's ok.
22.5% of the text are stop words. The average number of words per sentence of 12.26 words is good. A viewport "width=device-width, initial-scale=1.0, maximum-scale=1.0, minimum-scale=1.0, user-scalable=0" is provided. The usage of strong and bold tags is perfect. We recommend the use of up to 25 tags for this page. H2 Full-Service Agentur für Wohnen auf Zeit. H2 Ihre Wünsche stets im Blick! H2 Wohnung mieten schnell und einfach, ganz nach Ihren Vorstellungen! H5 HomeCompany – Ihre TOP-Adresse in Sachen ‚Wohnen auf Zeit‘. H5 HomeCompany – Die erste Adresse in Sachen ‚Wohnen auf Zeit‘. H5 www.homecompany.de – online möblierte Wohnungen finden! There are 3 links with a trivial anchor text. There are too many external links (169) on this page. This website redirects to "https://www.homecompany.de/de/index"
The file size of the HTML document is fine (74 kB). This website only has backlinks from 26 referring domains. This website only has 121 backlinks. This website only has few backlinks from 24 different ip addresses.